Exemplified through the pictured Love Lies Bleeding (2017) piece, Adam Wallacavage‘s art is an intersection between form and function. 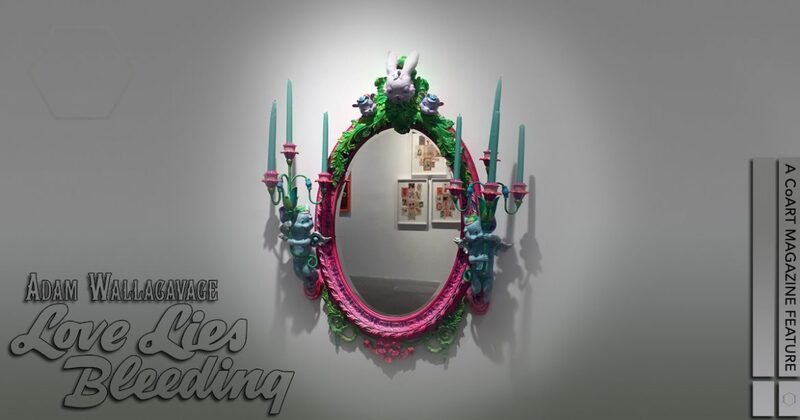 Merging neo-Victorian aesthetics and kitsch culture, Wallacavage’s sculpturals tend to inspire awe with their surreal subjects while simultaneously serving a practical use; like how Love Lies Bleeding transforms an antique reproduction mirror into a hanging work of art that one can gaze at their own reflection in. Taking its name from the Amaranthus caudatus, a flower better known as love-lies-bleeding, this piece employs similar colorations to that plant. Using its blossomed form’s spikes of pinkish-red blooms set against the vibrant green leaves and stems as a basis, Wallacavage has decorated the mirror’s frame with spray paint and pigmented epoxy resin in similar hues. But that appears to be the extent of the similarities, the massive 43 in. by 38 in. work imbued with less relevance from its title than from what its actual function is. Mirrors in any fantastical context evoke Through the Looking-Glass, to which Wallacavage’s Love Lies Bleeding is no exception. Amidst the epoxy clay sculpted embellishments are several character creations, each based around a cast plaster squeaky toy head. The rabbit head atop, given the context, becomes reminiscent of the March Hare, a dark demeanor of madness expressed through its downward tilt. And the pair of cow characters adjoining him are enantiomorphs, or three-dimensional mirror images, their mindless expressions recalling another identical pair: Tweedledum and Tweedledee. On the other hand, the duplicate set of elephant-headed cherubs on the mirror frame’s sides evoke thoughts of the famed flying pachyderm Dumbo. Though, for those well-versed in Lewis Carroll‘s universe, it may serve a sly reference to Alice mistaking — at a great distance — elephants for fluttering bees. And, whether intentional or not, these connections are quite apt for Love Lies Bleeding, as it serves as a wonderful entry point for viewers into Wallacavage’s personal Wonderland. Wallacavage’s Love Lies Bleeding made its public display debut as part of the Welcome to New Jersey exhibition at Jonathan LeVine Projects. Having had its opening reception on Saturday, February 18th from 6-8pm, all works in this exhibition will remain on display until March 18th, 2017 at the gallery’s physical location (888 Newark Ave, Jersey City, NJ 07306).